Home > interest rates > What Will Brexit Bring to the US? What Will Brexit Bring to the US? One of the oddest things in this increasingly odd world is the spread of negative interest rates everywhere but here. Why, when the dollar is generally seen as the premier safe haven currency, would Japan and much of Europe have government bonds — and some corporate bonds — trading with negative yields while arguably-safer US Treasuries are positive across the entire yield curve? One answer is that the Bank of Japan and the European Central Bank are buying up all the high-quality (and increasing amounts of low-quality) debt in their territories, thus forcing down rates, while the US Fed has stopped its own bond buying program. So the supply of Treasury paper dwarfs that of German or Japanese sovereign debt. Greater supply equals lower price, and lower price equals higher yield. The other answer is that this is just one of those periodic anomalies that persist for a while and then get arbitraged away. And Brexit might be the catalyst for that phase change. (CNBC)- European Council President Donald Tusk became the latest official to voice those concerns. In an interview with German newspaper Bild, Tusk said a Brexit vote to leave would be a boost for anti-European interests who would be “drinking champagne.” “As a historian, I fear that Brexit could be the beginning of the destruction of not only the EU but also of western political civilization in its entirety,” he said in the interview. Tusk said the long term consequences are difficult to see but that every nation in the EU would be hurt economically, particularly the U.K. The yield on the benchmark U.S. government note closed at the lowest level since December 2012 on Tuesday as the yield on Germany’s 10-year debt fell below zero for the first time on record. Tuesday’s move extends the record declines in high-grade global government bond yields, reflecting investors’ consistent concerns over sluggish global economic growth and the limit major central banks are facing in boosting growth via their unconventional monetary stimulus. Traders say investors need to buckle up for higher market volatility. The VIX, a key measure of volatility in the U.S. stock market, hit the highest level on Tuesday since February. As investors cut risk appetites, it stokes demand for haven debt. The yield on the benchmark 10-year Treasury note fell for a sixth consecutive day and settled at 1.611%, compared with 1.616% Monday. It fell to as low as 1.569% during Tuesday’s trading. 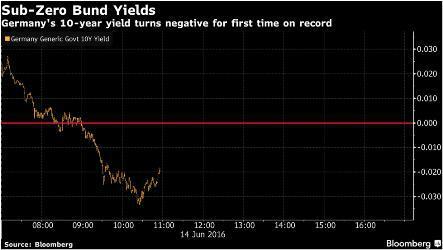 Yields fall as bond prices rise. The yield’s record closing low was 1.404% set in July 2012. Some analysts and money managers say they expect the yield to breach that level in the months ahead. Our ability to accept crazy new things and incorporate them into “normal” life is truly amazing. Negative rates, as the initial surprise wears off, do indeed seem to be merging into the background, becoming simply part of the financial environment. But they shouldn’t. Some things — for instance gay marriage or drug legalization — seem revolutionary but are on balance either harmless or beneficial. But negative interest rates are indeed revolutionary in the sense that they turn the operation of capitalism on its head. In a negative interest rate world, debt generates a profit and saving shrinks capital. Governments and corporations are paid to rack up ever greater obligations and thus have no incentive to control their natural hubris. To re-purpose some of John Maynard Keynes’ words, fair becomes foul and foul becomes fair, because foul is profitable and fair is not. This is a world, in short, where all the old limits on our worst natures are removed and anything, no matter how long-term destructive or contrary to the laws of economics, becomes permissible. And where the only possible outcome is a crisis as epic in scale as the mistakes that will bring it about. If gold-bugs circa 2000 were asked to sit down and design an environment in which owning precious metals is an absolute no-brainer, they’d produce the following: Unrestrained government spending leading to overwhelming debts leading to debt monetization leading to universal negative interest rates. A highly-unlikely wish list that is on the verge of coming true.